This cozy cafe will be your next coffee-date spot. 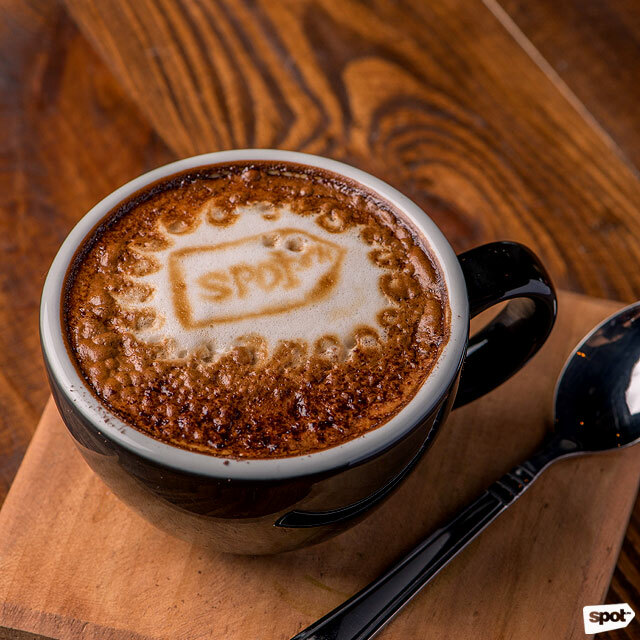 (SPOT.ph) We've all had days when nothing but a good shot of caffeine can get you through it all. 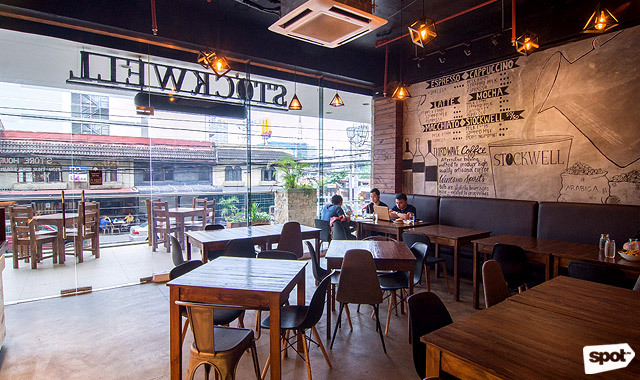 If you’re on the lookout for a place that offers an excellent menu of coffee and coffee-based drinks as well as a cozy space where you can hide away from the world, Stockwell Café + Lounge in Tomas Morato, Quezon City is definitely worth a visit. Stockwell is spacious, with floor-to-ceiling glass windows allowing sunlight to stream inside the coffee shop. 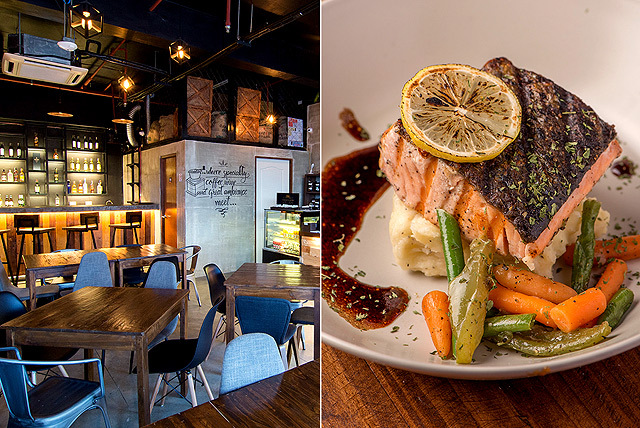 Sherwin Choy, who owns Stockwell with his sister Shandie Tecson, describes the interiors as a mix of industrial and fine-dining elements, an unusual combination that somehow works. 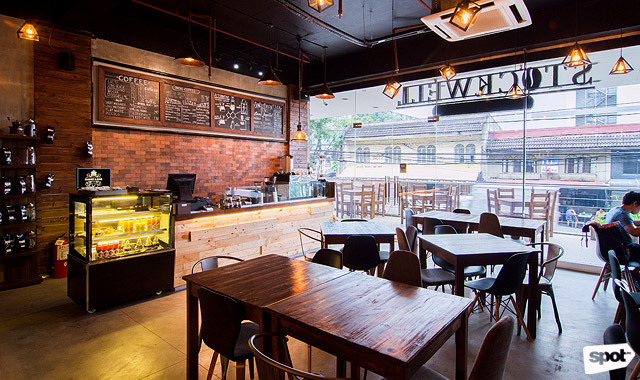 Brick and wood walls give the café a homey vibe, while small pendant lights add a touch of elegance. Of course, coffee is the star here at Stockwell. 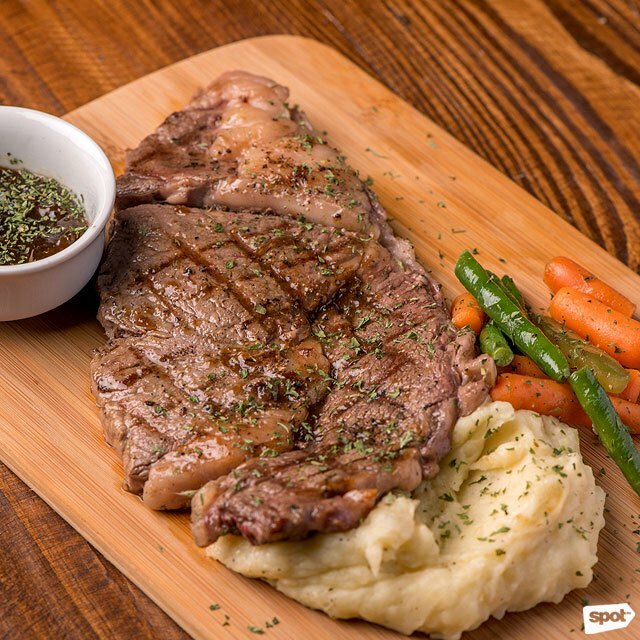 Third wave cafés, says Sherwin, usually share the same base menu with coffee-based drinks, and at the end of day, it all really boils down to what kind of beans are used. And here at Stockwell, they definitely know their coffee beans. 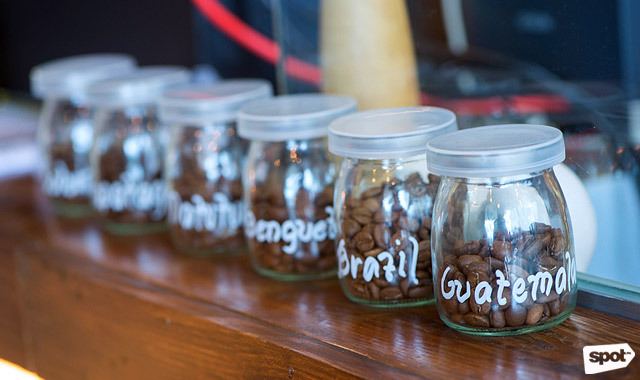 The café offers six different beans to choose from: Matutum, Kapatagan, and Benguet, which are local beans, as well as Brazil, Colombia, and Guatemala. What sets Stockwell’s coffee beans apart, shares Sherwin, is their source: a private supplier who lets them customize the beans to match Stockwell’s specifications. 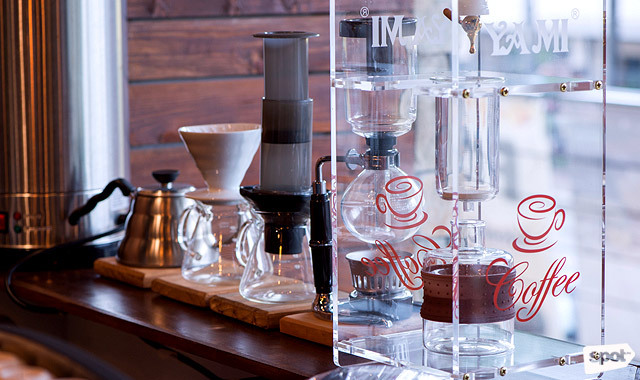 Aside from the high-quality beans, Stockwell Café also has six different kinds of alternative brewing techniques to choose from: the Cold Drip (P160), V60 (P120/hot, P130/over ice), and Aeropress (P110/hot, P130/over ice), which Sherwin points out isn’t served by most coffee shops. Both coffee aficionados and those who have a casual interest will enjoy watching the baristas prepare their brew, and the staff is quick to share their knowledge with everyone. In fact, part of what’s in store for Stockwell’s future are coffee appreciation events, where Sherwin and the team will hold classes on third wave coffee, where you can learn everything from different kinds of coffee beans to the types of alternative brewing methods and how each will change the way your brew will taste. 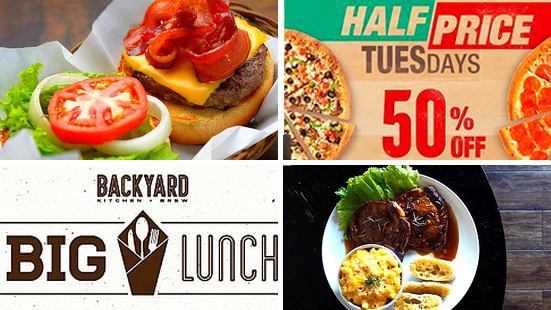 But for now, there are loads of delicious reasons to visit Stockwell. Aside from their third wave coffee, the café also has a separate menu of espresso-based drinks. The espresso here is made from a customized blend of Arabica and Robusta beans for a flavor that is mild but still with that kick you look for from a good shot of espresso. The Latte (P120/hot, P130/over ice) is a good no-frills drink to start with, especially if you find yourself a little overwhelmed with all the brewing options available. The Stockwell 50/50 (P150/hot, P160/over ice) is an intriguing blend of milk and a secret ingredient that Sherwin refuses to share. 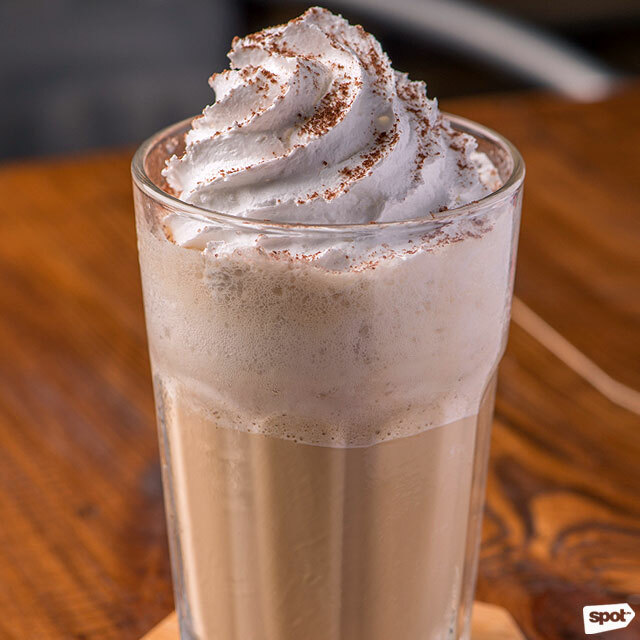 The result is a flavor that is similar to the latte, but with a bolder chocolate-like kick. Non-coffee drinkers will enjoy the Matcha Green Latte (P130/hot, P140/over ice), with the strong earthiness of tea all matcha lovers crave. 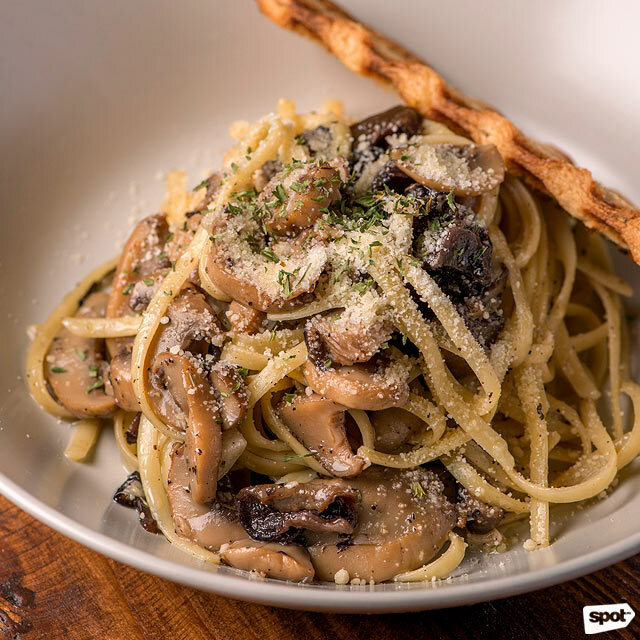 Aside from coffee, Stockwell also boasts an extensive menu of appetizers, sandwiches, and pasta. 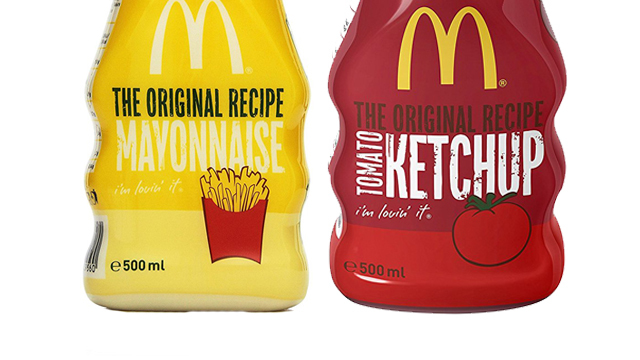 The recipes were all developed by Sherwin, who wanted the flavors to complement their drinks perfectly. 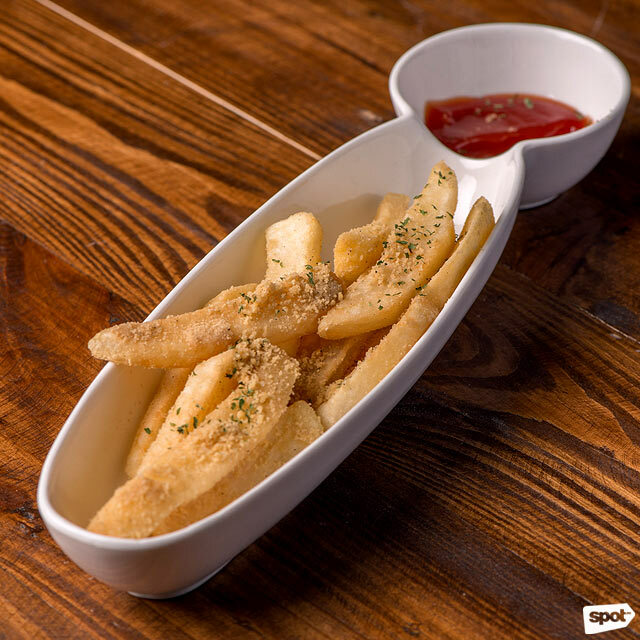 The thick-cut Garlic Parmesan Fries (P150) are crisp and addicting, while the aroma of the Truffle Mushroom Linguine (P250) as it’s set on your table is already enough to make your mouth water. The plate is deceptively light, with the truffle flavoring the pasta with restraint, but it is also incredibly filling. It’s best to come with an empty stomach, especially when ordering the hefty sandwiches. 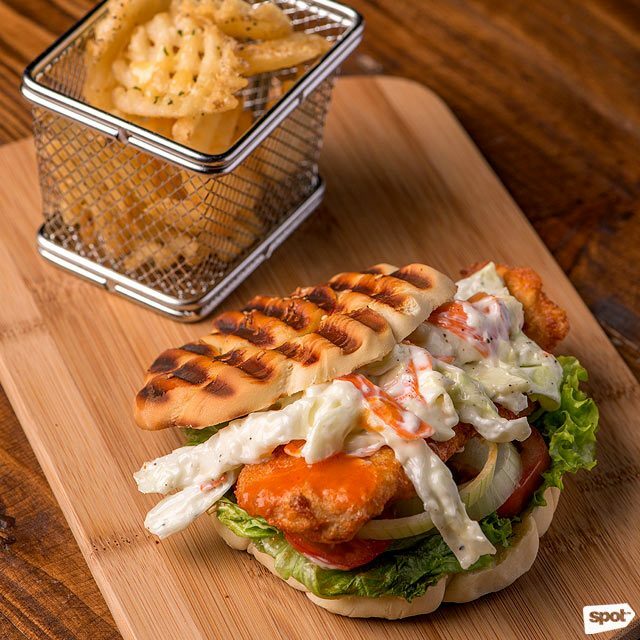 Sherwin describes the Buffalo Chicken Sandwich (P235) as a “deconstructed and reconstructed” version of buffalo chicken wings, with a thick slice of fried chicken fillet flavored like spicy buffalo wings and a cool and mildly sweet coleslaw. 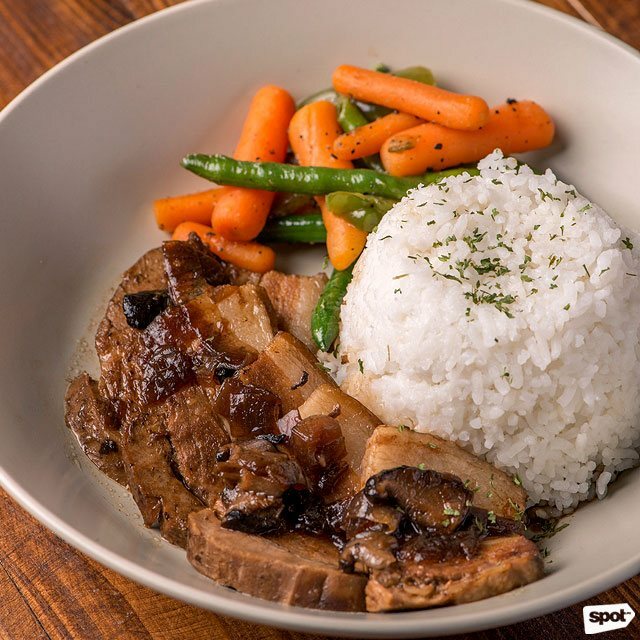 Those who like heavier fare would look forward to the rice meals (tentatively priced at P190 to P220), which Stockwell will be rolling out later this year. 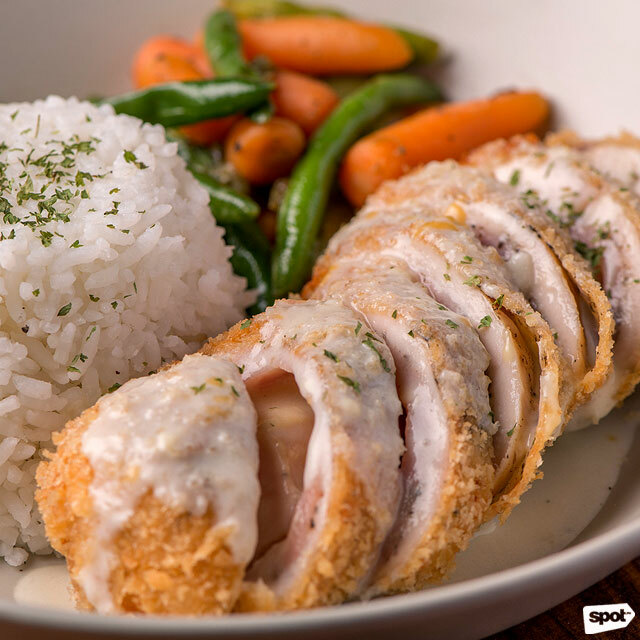 The Braised Pork is covered in a delicious sweet-savory glaze and is melt-in-your-mouth soft, while the Chicken Cordon Bleu has cheese bursting out of each slice. 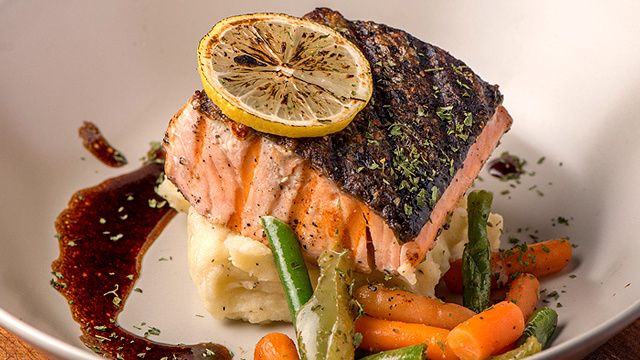 If you’re already planning a Valentine’s day date, better note this down: Stockwell is working on a Valentine’s Day Special with a menu of soup, two mains, a slice of cake, a bottle of wine—and trust us when we say that their Steak with Truffle Mashed Potato will make anyone swoon. 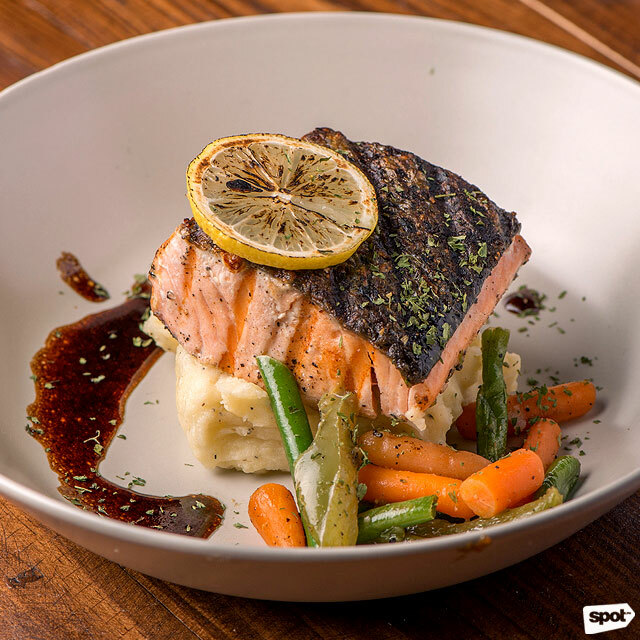 If your date is more of a fish lover, Stockwell still has you covered with their fresh and tasty Salmon. Aside from coffee, Stockwell also has a full bar and an extensive wine list, which they offer by the glass. And yes, wine is available throughout the day (because we definitely had to ask). So whether you’re looking for a place to work in peace or one where you can unwind after a busy day with good food, good drinks, and the perfect chill ambience, Stockwell is definitely one to visit.